Much of the first round of the 2016 NFL Draft was overshadowed by the bizarre situation of Laremy Tunsil. 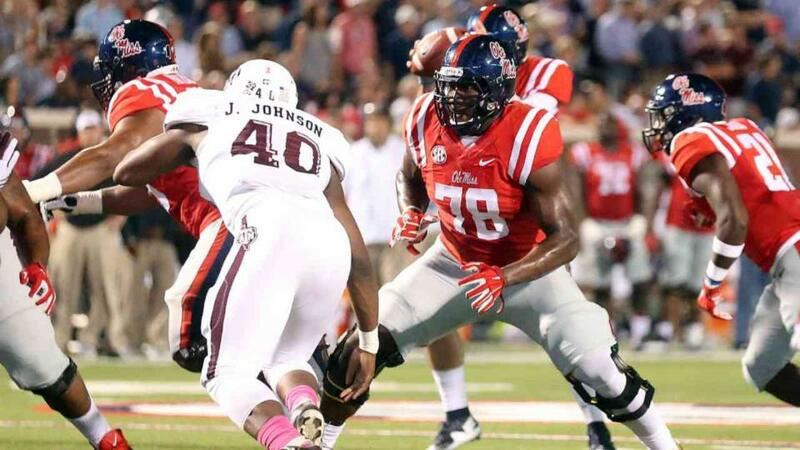 Tunsil, an offensive tackle from Ole Miss once considered the No. 1 pick, had his social media accounts hacked moments before the draft. First, Tunsil's Twitter account posted a video of him smoking with a gas-mask bong. Tunsil then proceeded to slide out of the top the ten until the Dolphins took him with the 13th pick. Shortly after he was drafted, his Instagram appeared to be hacked with screenshots of text messages alleging Tunsil asked Ole Miss head coach Hugh Freeze for money to pay rent and bills. Tunsil acknowledged the Twitter video, saying it was old and he would behave off the field. He said he was hacked on Instagram,denied asking for money, then, strangely, seemed to say he did before he was pulled out of his press conference. It was a bizarre night, and it seems details of what happened are still to come. Yet when NFL commissioner Roger Goodell was asked about it on ESPN's "Mike and Mike" Friday morning, he offered an odd response. He first said he was unaware of the incident until after Tunsil was drafted, and then he said it's what makes the draft "exciting,"
"I really wasn't [aware]," Goodell said. "It was quite a bit later in the first round when I first heard about it. We're just so busy, I just didn't have a moment to hear about it... It was after he was picked." When asked of his reaction to the incident, Goodell said, "Well, I think it's all part of, you know, what makes the draft so exciting. Clubs make decisions. They make decisions, sometimes they take risks, sometimes they do the right thing, sometimes they don't, and we'll see. Hopefully he's going to turn out to be a great young player." It seems unlikely that Goodell wasn't aware of the Twitter video at all, given that it became the biggest story of the draft. However, if he truly didn't, it is bizarre for him to say it's what makes the draft exciting. Goodell, while also on "Mike and Mike" answered questions about Deflategate and Tom Brady's recent reinstated suspension. He said his job is to protect the "integrity" of the game. One would assume that a top prospect falling in the draft after video shows him smoking a bong, then later having alleged text messages asking for money leaked would be a nightmare for the NFL. Perhaps Goodell figures that any publicity is good publicity, but it's a change in tone from his expected response. Ex-#Patriots & #Bucs G Logan Mankins was tough, nasty, played through the whistle… and is a great dude when the play ends. One of a kind.